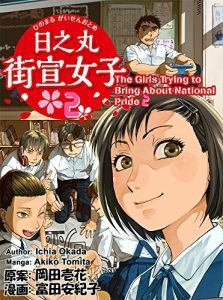 Hinomaru Gaisen Otome (日之丸街宣女子) is a right-wing nationalist manga/cartoon series by Akiko Tomita (富田安紀子). Episodes are first published in JAPANISM, a bimonthly magazine from Seirindo, and later compiled into comic books. The first volume published in 2015 follows the main character, a middle school girl, who encounters an anti-Korean demonstration and “discovers” the “truth” that the mainstream media hide about the oppression of Japanese people by the Korean minority. The anti-Korean demonstration Tomita depicts are similar to those organized by Zaitokukai in reality, and many counter-demonstrators who protest them are also said to be based on real anti-fascist activists. The second volume, published in 2016, explores yet another “hidden truth” of the comfort women issue. The chapter opens with a former classmate of the main character who had moved to Southern California discussing violent hate crimes and bullying that she is experiencing as a result of the construction of a comfort women memorial in Glendale. The storyline is based on the thoroughly debunked false claim of rampant bullying against Japanese children in that city.